On a hot, muggy night in Charleston, S.C., 21-year-old Dylann Roof walked into the basement of the Emanuel A.M.E. Church and joined a dozen Wednesday evening Bible study members as they studied Mark 4. It was June 17, 2015. The teacher, Myra Thompson, warmly welcomed the 5-foot-9-inch, 120-pound boyish-looking man with the pale face. Roof’s tousled blond hair was cut in a salad bowl shape, and he wore a tourist’s fanny pack around his waist. Clementa Pinckney, Emanuel’s pastor, invited Roof to sit next to him, and someone placed a Bible in his hands. Roof sat quietly during the Bible study, saying nothing, his facial expression blank. At 9 p.m., Myra ended the study, standing with the others to pray. Suddenly Dylann pulled a Glock .45 from his fanny pack. Piercing the quiet fellowship hall with an exploding CRACK! CRACK! CRACK!, he opened fire on the praying members. Shooting each person multiple times at point-blank range, and shouting hateful racial slurs, he killed eight church members immediately, including Myra Thompson and Pastor Pinckney. The ninth victim died shortly thereafter. Roof walked out, leaving the dead, dying and terrified behind him on the blood-stained floor. The church security camera recorded his image, the gun still in his hand. Word of the church massacre spread throughout the city, turning Charleston’s narrow streets into tangled mazes of screaming sirens, flashing lights and panicked onlookers. When Myra’s husband, the Reverend Anthony Thompson, pastor of Charleston’s Holy Trinity Reformed Episcopal Church, arrived home from his church’s Wednesday evening program, a friend telephoned him. “There’s been a shooting at Emanuel Church!” he said. Anthony rushed to the church. When he discovered his wife’s murder, he fell to the pavement and cried. Rev. Anthony Thompson stands outside Emanuel African Episcopal Church. Police found Dylann Roof the next morning, arrested him and took him back to Charleston. When two FBI agents interrogated him, the young racist laughed, bragged about the murders and claimed he had hoped to start a race war. 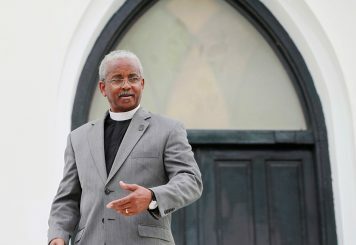 He admitted he had chosen Charleston and the Emanuel A.M.E. Church for his massacre because of their past slave history. On Friday, June 19, fewer than 48 hours after the murders, Anthony reluctantly attended Roof’s bond hearing. A video camera from the detention center linked Roof to the courtroom. Judge James Gosnell invited the victims’ family members to speak directly to Roof through an audio connection. Although Anthony didn’t intend to say anything, he felt led by God to walk forward. He depended on God to put His words into his mouth. Several other family members at the hearing also offered their forgiveness. City and state police prepared and braced themselves for the racial riots they expected to explode in Charleston, fearing the bloodshed, violence and looting as recently witnessed in Ferguson, Baltimore, Berkeley and other cities after racially-motivated crimes had occurred. Makeshift memorials of flowers grew in front of the church. Compassionate donors pledged thousands of dollars to help the victims’ families. Thousands of people gathered in downtown Charleston for an evening vigil and prayer service. The whole city mourned the senseless deaths, visible acts of love setting off a godly chain of events as blacks and whites embraced, crying together and comforting one another in Charleston’s crowded streets. 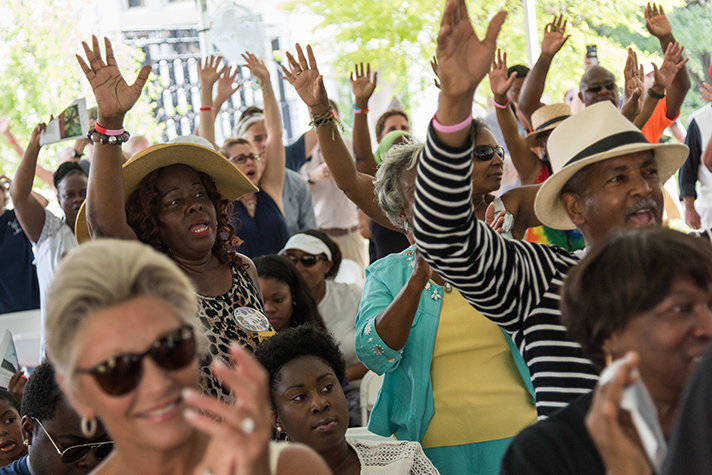 More than 15,000 people of all colors and faiths joined hands, creating a flesh-and-blood human bridge, a chain of visible love that stretched for two miles and crossed Charleston’s Ravenel Bridge. After the shooting, and having witnessed the powerful and peaceful results brought about by Biblical forgiveness, the world struggled to better understand it. They wondered how Anthony Thompson could forgive his wife’s cold-blooded killer, and even share with him the message of Christ’s forgiveness and salvation. Before Thompson forgave him, should Roof not have first apologized, expressed remorse and tried to make amends for his actions? Did forgiving Roof mean that Thompson dismissed, excused or condoned his ruthless act? Mustn’t Thompson have felt forgiving before he forgave Roof? How could Thompson forgive so quickly, before his wife was even buried? Doesn’t genuine forgiveness take years to accomplish? Can forgive any crime, no matter how atrocious—not dismissing, condoning or excusing an offender’s actions, but blaming him and then forgiving him. Thompson blamed Roof for killing his wife, and therefore he could choose to forgive him. Doesn’t depend on the offender’s response. Roof remained consistently unrepentant, showing no remorse and never apologizing. “I would like to make it crystal clear,” Roof wrote in his journal, “I do not regret what I did. I am not sorry. I have not shed a tear for the innocent people I killed.” Later, during his April 2017 trial and federal death sentence, Roof publicly stated: “I felt like I had to do it. I still feel like I had to do it.” Thompson forgave Roof without the young racist’s response, remorse, repentance or apology. Doesn’t require the forgiver to feel forgiving. Forgiveness is a choice of the forgiver’s will, not a decision based on emotional feelings. Paul writes: “Bear with each other and forgive one another if any of you has a grievance against someone. Forgive as the Lord forgave you” (Colossians 3:13). Requires believers to pray as Jesus taught, asking God to “forgive us our debts, as we also have forgiven our debtors” (Matthew 6:12). Jesus gave believers the perfect example of Biblical forgiveness when He forgave those murderers who nailed Him to the cross. “Father,” He prayed aloud in His time of great suffering, “forgive them, for they do not know what they are doing” (Luke 23:34). Anthony Thompson’s choice to forgive his wife’s murderer brought Scriptural forgiveness and Biblical teachings into the world’s media limelight. Christ worked in the midst of this tragedy to change hearts and lives. Denise George is the author or coauthor of 31 nonfiction books. She recently worked with Anthony Thompson on his new book: “Called to Forgive: The Charleston Church Shooting, A Victim’s Husband, and the Path to Healing and Peace” (to be released in June 2019 by Bethany House Publishers). Denise is married to Timothy George, Th.D., founding dean of Beeson Divinity School, Samford University. Have you asked Christ to forgive your sins? Start here.